We Solved Another Puzzle. Here's the (unexpected) answer. Good news! We solved another puzzle. If you’re an astute observer of birds, you may notice that something is missing in the above photo of a Sandhill Crane. Sandhill Cranes have long legs that extend way behind them as they fly. It’s cold. Really cold. Sunrise temperatures were 13 F (-10 C) on the morning when I took this photo. It was so cold that ice had formed on top of the water that this bird stood in during the night. When morning came, the bird had to wiggle its legs free and then step up onto the ice before it could fly. As you might imagine, after spending a night standing in ice cold water, this bird had cold toes. Once in the air, the bird folded its legs, tucking them under its body feathers. That served to warm its toes and conserve body heat during its flight to a feeding area. The photo was taken at Bosque del Apache, near San Antonio, NM. Interesting! I don’t see Sandhill Cranes in my area, but do see a lot of great blue herons and I don’t think I’ve ever seen them tuck their legs in like that. Fascinating story. Thanks for posting this, Steve. Gives me even greater respect for Mother Nature’s creations! I’m camping in Blythe, CA, and these cranes fly over us everyday. Glad to see it close up.. I’ll share the photo with others here. A very cool shot Steve. Naturally, I just assumed it was a JATO (Jet Assisted Take Off) launch like we used on some of our SAC bombers during the Cold War with the Russki’s. Then I noticed the lack of a smoke trail, or jet engines for that matter, and realized some new physics were involved. Possibly anti-gravity. Your theory about those big-ole legs tucked-up underneath the feathers is a bit far fetched though, I might need a little more proof of that. As usual, stellar work. Doesn’t need no stinkin’ legs – he’s a waterfowl! Appreciate your keen observations and your trusty lens. Thanks. So cool! I love your artistic beauty, thanks Steve.. It’s beautiful. 13 degrees and you were there to capture the shot! Bravo (brave-o!). But do they ever get those legs stuck in the ice? Thanks, Steve. Beautiful shot and great educational commentary. Thanks Steve! Wow another amazing photo and an interesting story too!!! Thank you for sharing your world Steve! Dang! That’s really cold for Bosque del Apache, isn’t it, even for this time of year? The solution to the mystery of the legs makes total sense, when I think about it. Thank you! We see this often in the San Luis Valley of Colorado when the cranes are here during the Spring Migration. Nature is so marvelous and provides ways for survival. Great article. 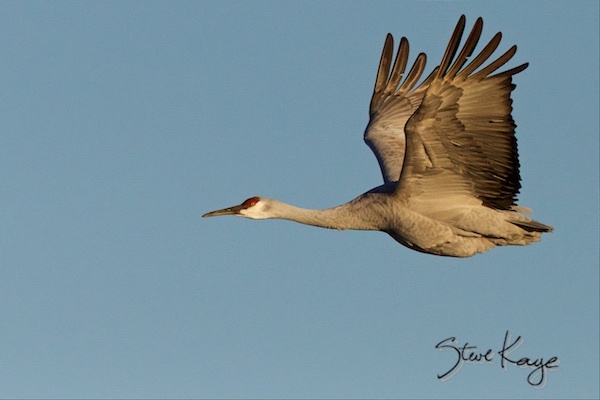 So strong and hardy in flight, I remember seeing flocks of Sandhill cranes on the ground when driving through southern Idaho on the way to Boise from California years ago. I think it was in the Fall.